One of the things that has been highlighted many times at Minigolfnews is the fact that the sport of miniature golf can be played by anyone, even in official tournaments. Age isn�t a restraint, men and women play against each other and even cost of play is one of the lowest of any professional sport there can be since at some tournaments you can use the course ball and putter. In Portugal the inclusionary aspect of minigolf is on display in the month of May in a way it hasn�t been in the past. 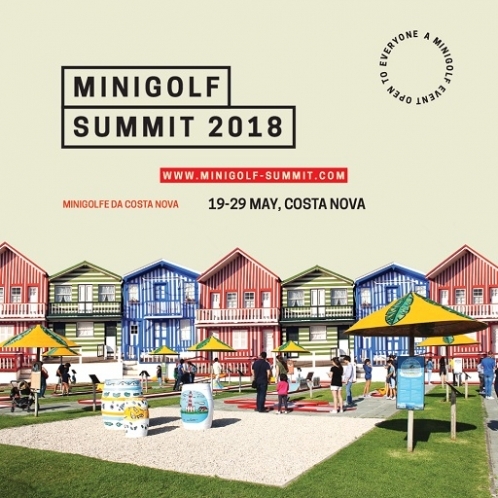 From May 19 � 29, 2018, Costa Nova is hosting the first Minigolf Summit, which will include a tournament for both deaf and blind putters. The nearly two week series of events kicked off with XXII �PALHEIROS DA COSTA NOVA�, a traditional tournament of the Costa Nova Minigolf Club that started in 1996. Results of the tournament can be found here. The real highlights of the event start on May 25, with the two-day European Minigolf Tournament for the Deaf, the first continental championship of it�s kind. It follows the 1st World Deaf Championships that were held in Croatia in September 2017, and is organized by the Costa Nova�s Minigolf Club has joined the �gueda Cultural Association for Deaf People and the European Minigolf Federation. There will be both a team competition and an individual competition over several categories including youth and seniors. Following that tournament, on May 29th, will be another first of it�s kind, a minigolf tournament for the blind. This tournament will be played with lanes and accessories specifically adapted for the blind and as Victor Conde�o, president of the European Minigolfsport Federation, put it, it shows that miniature golf is an �integrative sport that can be played by all without limitation." More information about all of the tournaments, including recent press and pictures can be found here.